There aren’t a lot of good arguments for spending more time in a car in L.A., but there’s at least one great argument: a live Mario Kart competition called the Mushroom Rally, which is an especially unfortunate name in these post-Stormy Daniels memoir times. Maybe you’re a fan of either the OG Super Mario Kart or Mario Kart 64, which is permissible because respecting your elders is cool. Maybe you, like me, have impeccable taste, and so you know that the version for GameCube (aka Double Dash!!) is indisputably the best version. Or maybe you spent years of your life mastering Kart for Wii or like, the Nintendo Switch, because, I don’t know, you’re a maniac. Who’s to say, really. In any case, we’re all on the same team here, which is the pro-Mario Kart team. And I challenge anyone on the pro-Mario Kart team to deny that they’ve dreamt of participating in a real-life version of the game. About 600 people will be racing in groups of 20 at a time. 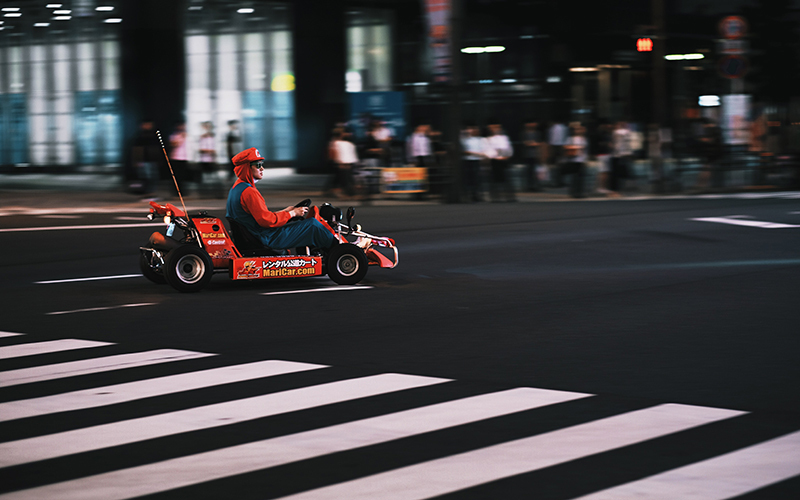 Unlike Japan’s MariCar races, Mushroom Rally does not take place on actual streets; all races go down over two days (dates are still TBD) on a custom-built track. Your ticket—cost as yet undetermined—includes 30 minutes of racing and a costume (if you take Koopa Troopa I will murder you). There will be a number of prizes given out day-of, but if you blue-level boost your way to a win, you’ll be gifted tickets to compete against champions from other cities in Las Vegas. It’s no All Cup Tour, but it’s about as close as you’ll get for the time being. Sign up for updates on the Mushroom Rally site, and in the meantime, start stockpiling banana peels.